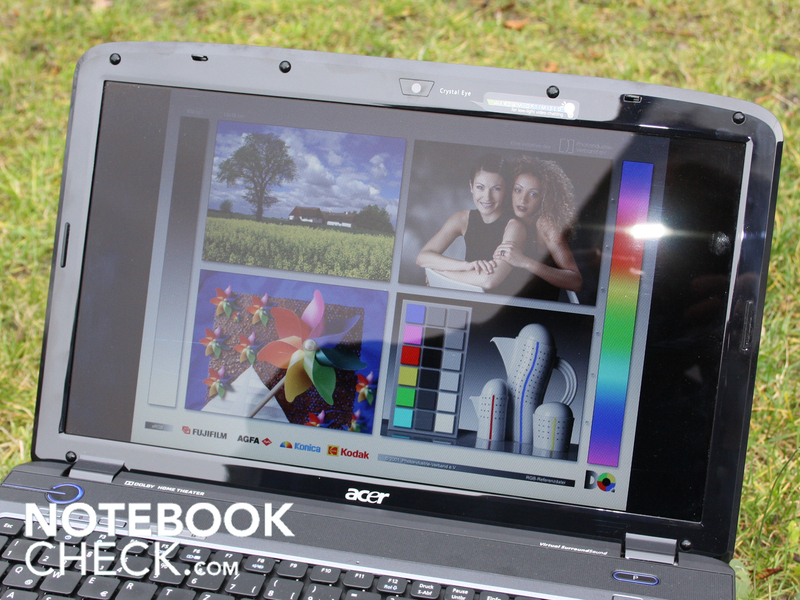 Acer's 3D notebook is aimed at lovers of film and multimedia. With the help of 3D glasses, every film, photo and game can be experienced in a new dimension. And it should not be written off as an expensive gadget for technology geeks; the Aspire 5738DG only costs 150 euros more than the same hardware without the 3D features. Consumers generally try to get the maximum amount of hardware for the minimum price. Manufacturers have adapted to these conditions, but it is not an easy way to make money. So Acer has come up with a new draw - a notebook that works in three dimensions. It has done this without resorting to LCD shutter glasses and a 120 Hz screen, like rival Asus with their G51J 3D gaming notebook, which uses Nvidia's 3D Vision technology. 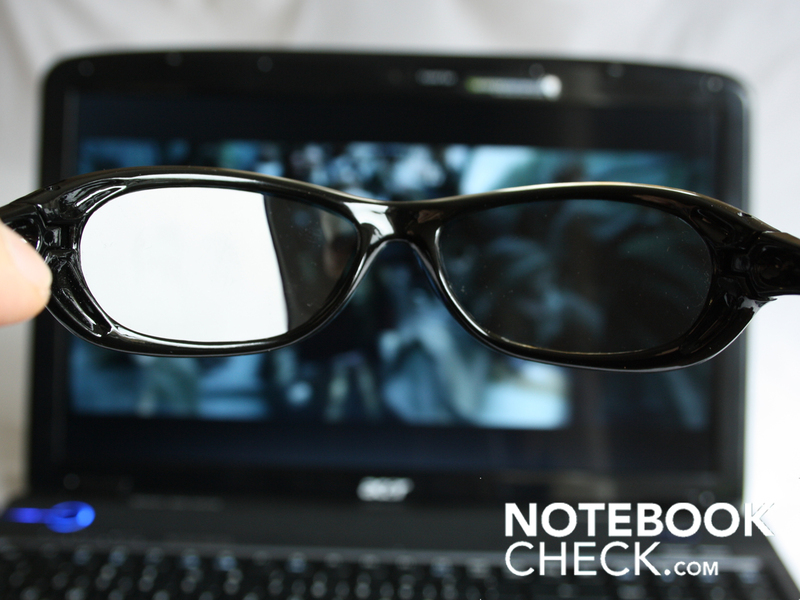 Instead Acer has simply placed a special filter over the screen, and included a polarising filter in the form of a pair of sunglasses. Both approaches have the same goal - an especially realistic illusion of depth within games, films and photographs. The biggest difference between the manufacturers' two approaches is their target markets. The G51J 3D, with its powerful Nvidia GeForce GTX 260M (1.024 MB GDDR3-VRAM), costs 1,500 euros and is intended for serious gamers, whereas Acer has used an all-rounder hardware set-up with an ATI Radeon HD4570 and Core 2 Duo P7450 (2.13 GHz). 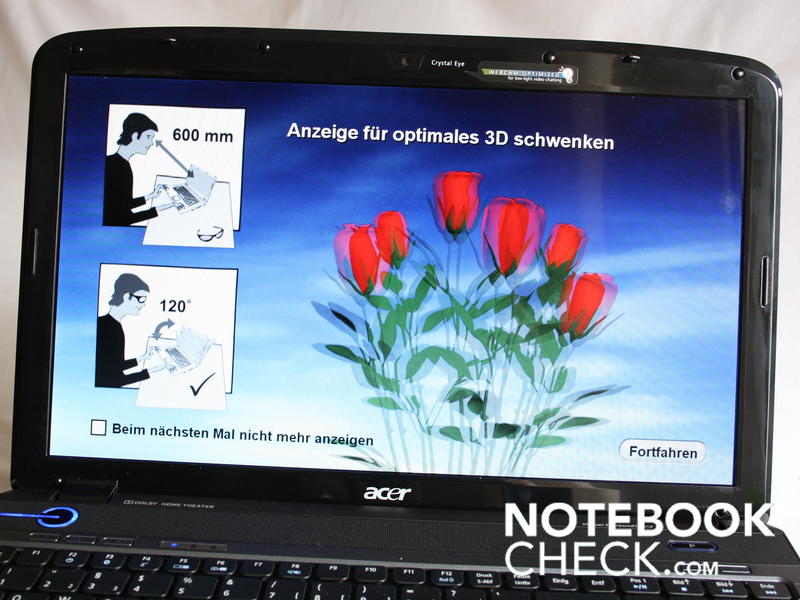 As a result, Acer's 3D notebook costs comparatively little - requiring an outlay of just 800 euros. 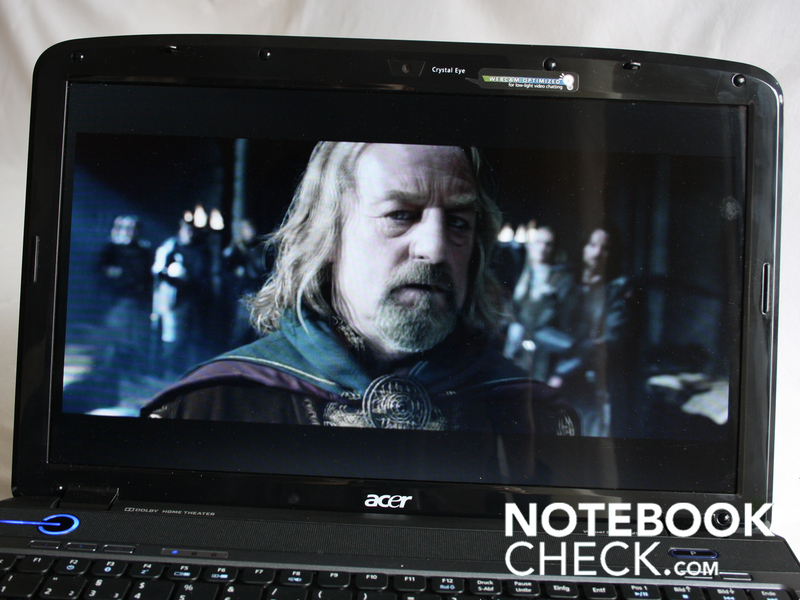 In this review, we will see whether the Acer Aspire 5738DG can win over film and entertainment fans, though it lacks the hardware needed for gaming. The Aspire 5738DG's case is best described as inconspicuous. But not in a negative sense; its matt surfaces are very pleasant. The palm rest area is a dark silver colour and has a pleasantly roughened feel to it, being covered in tiny dots. This surface is resistant to scratches from objects, for example rings. The silver surface continues unobtrusively around the whole of the keyboard. Above it, the loudspeakers are housed under a perforated section which is also matt. The case proves to be comparatively resistant to torque and in particular the palm rest area hardly gives at all under strong pressure. The same can be said of the underside of the notebook; even the access panels hold firm. 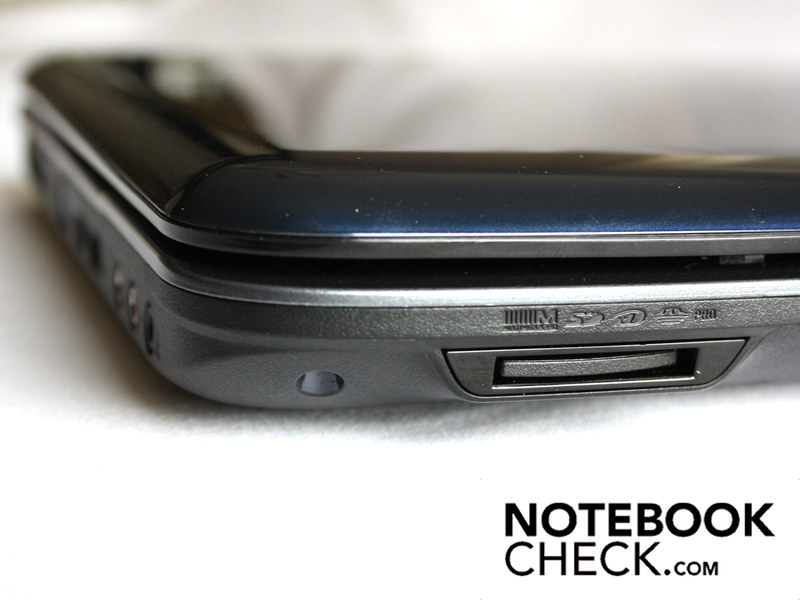 The hinges hold the lid tightly in position, so tightly that users will have to use both hands to open the notebook. It is commendable how firmly the hinges are mounted in the casing. The lid also brings some fresh colour to your living room; the shiny metallic blue with a recessed Acer logo does attract fingerprints, but at least it looks good. This surface is very vulnerable to scratches, we discovered. The power button glows in an unobtrusive blue circle, as is now typical for Acer laptops. When the mains adapter is plugged in, a line lights up between the circle and the power socket. We mention this point so particularly because the light begins to get irritating when you are watching a film. You may have to resort to covering the offending light source with a piece of paper. 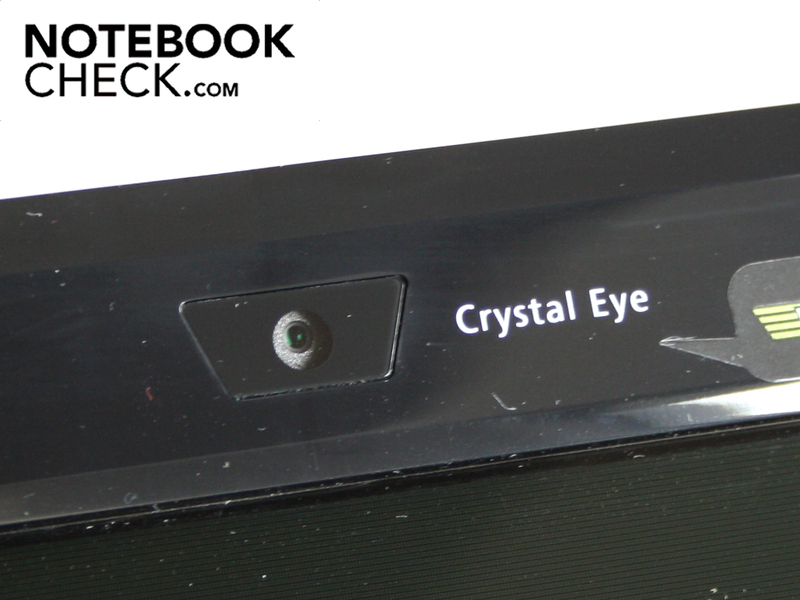 Acer has covered the basics with its ports, but extras such as Firewire or eSATA are absent. The manufacturers have even omitted an ExpressCard54 slot, which until recently was included as standard. On the other hand, you get a well-arranged bank of ports on the left hand side: ethernet, HDMI, two USBs, and three audio ports. The line-in is worthy of note, as it is rarely seen; it is positioned next to the S/PDIF and microphone jacks. The headphone jack is combined with the S/PDIF. Given that this is an entertainment system, we felt that perhaps a remote control and an infrared port would have been useful. The keyboard will please even a demanding office typist. 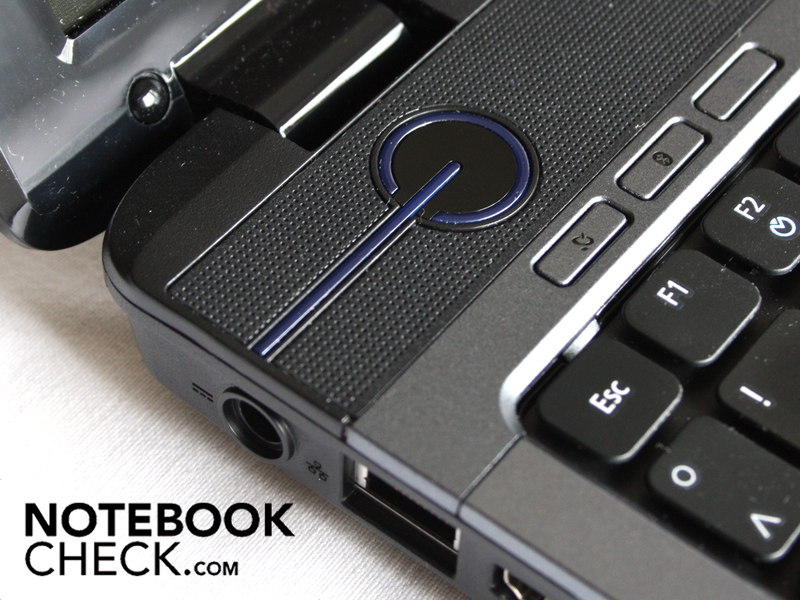 The chiclet-style keys have a clear response point and give good tactile feedback. Anyone who has to enter row upon row of digits will be well-served by the full number block, and it makes using a calculator much easier, for example. All keys are a good distance apart from each other, so that it is not hard to find the right keys even if you are touch typing. The touchpad is seamlessly integrated into the palm rest area and has a very large sensitive surface. The Synaptics Pad V7.2 is a typical Multi-Touch pad; users can rotate, zoom and scroll using two fingers. But we were particularly impressed by the scroll bar, which can be clearly distinguished by touch. Users who are not yet comfortable using the newfangled Multi-Touch system can stick to scrolling with one finger. 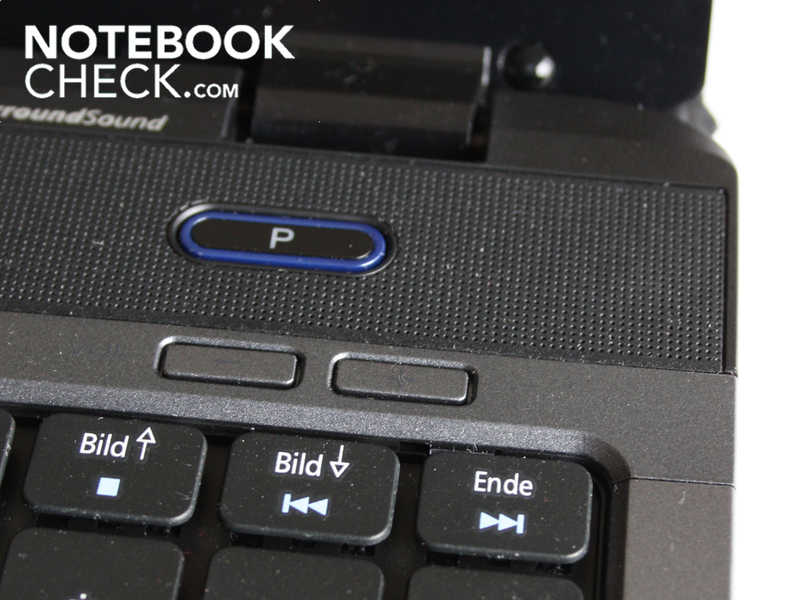 The touchpad buttons depress to a good depth but unfortunately they produce a loud and annoying clicking sound. 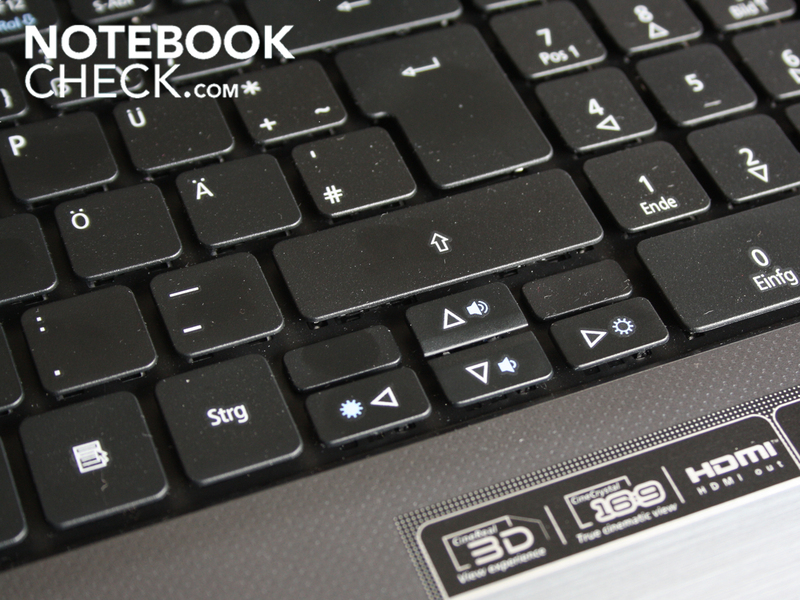 For a multimedia notebook, there is a distinct lack of hotkeys for multimedia controls. Acer has marked the top four keys of the number pad as Play, Stop, Forward and Back. Volume, on the other hand, is controlled by two actual hardware buttons, which are positioned above the number pad. It may be quite difficult for the user to find the right Fn combination during a film session in the dark. Acer has previously produced some excellent media control panels, making the multimedia controls on this 3D notebook rather disappointing. 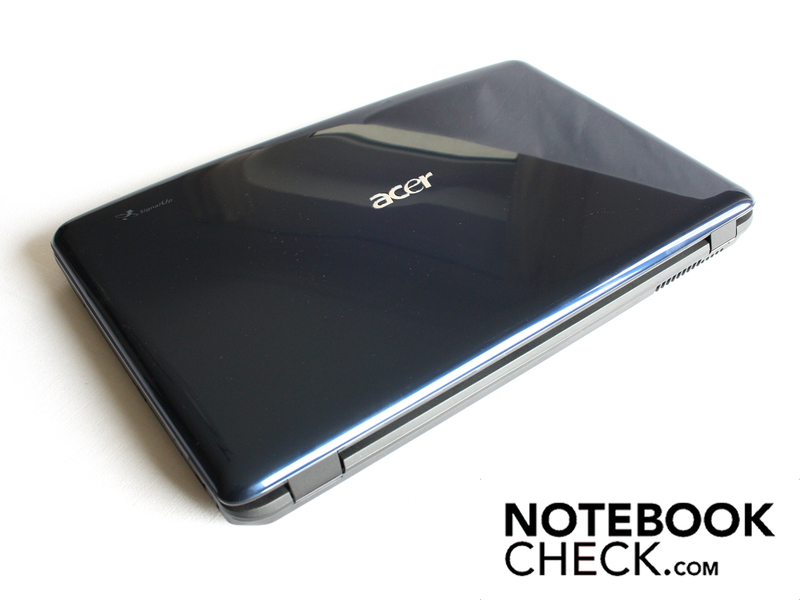 Acer's 3D notebook is fitted with a 15.6-inch LCD screen by Chi Mei (type N156B3-L02). 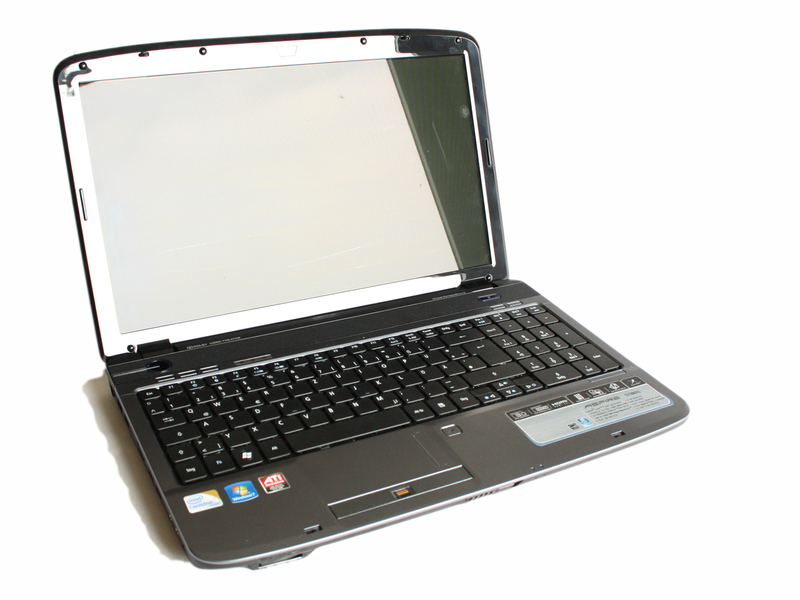 The screen does not have an anti-reflective coating. The surface looks homogeneous and flawlessly smooth, in contrast to many other reflective TFT displays. It has a standard WXGA resolution of 1366 x 768 pixels. 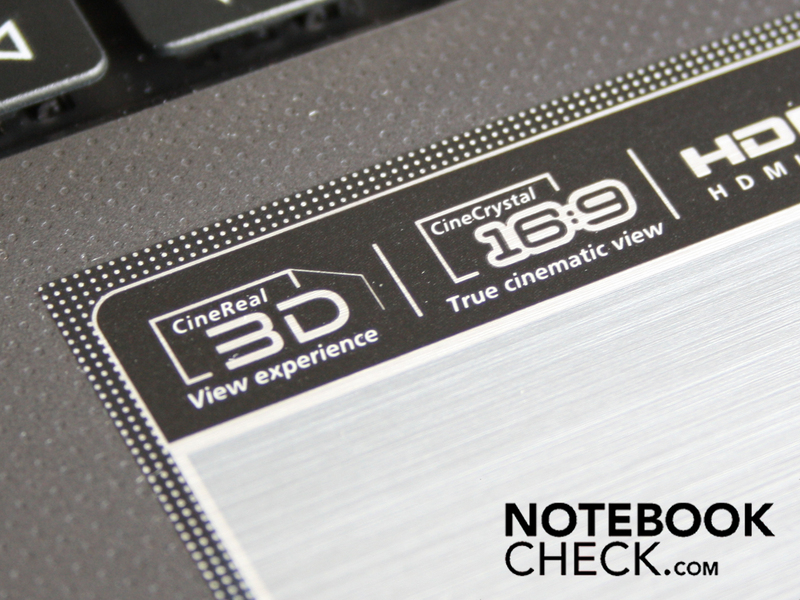 As this is a 3D notebook we expected great contrast, but after measuring a black value of 1.21 we feared the worst. And indeed, we calculated a mediocre contrast ratio of 198:1 at maximum screen brightness. 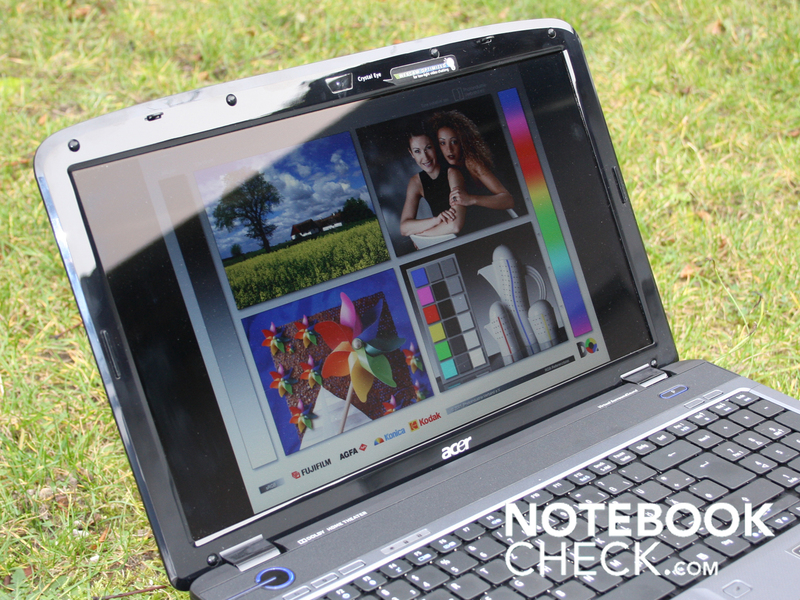 Multimedia notebooks with decent screens often have a contrast ratio of 500:1 or more. Colours appear crisper and fresher on such screens, whereas the black on the 5738DG has a slight grey sheen to it. Possibly the 3D images would have been more effective if the contrast ratio had been better. However this not a comment on the effectiveness of the TriDef software, but only on the laptop's screen. We measured an average screen brightness of 179.4 cd/m². The level of uniformity was acceptable at 82%. Given that the notebook will typically be used as a multimedia machine, this screen brightness is sufficient. However, using the 5738DG outdoors quickly becomes a chore due to the low screen brightness. You have to find a particularly shady spot to avoid direct sunlight and the reflections which plague the glossy display. It is even a problem indoors, as desk lamps are reflected very strongly in the 5738D's screen. For this notebook we have to differentiate between the viewing angles with and without the 3D effect. First without the polarised glasses: the horizontal viewing angles are very good. Even from a 60 degree angle to the left or right, the colours are still stable. The vertical viewing angles are much worse; the colours start to invert after a deviation of just 10 degrees from the ideal viewing angle. At 45 degrees you can hardly make out anything on the screen. So the notebook is eminently suitable for a DVD session with friends, as long as everyone's eye level is more or less the same. With the 3D effect, the viewing angles are similar except that you have very little leeway vertically. Acer recognises this deficiency, and when TriDef starts up you are told what the optimum screen positioning should be. 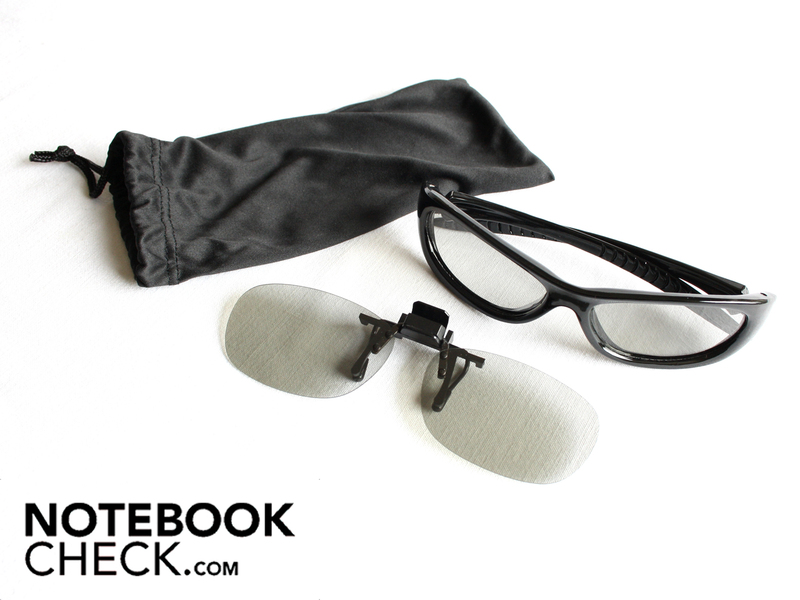 Polarised glasses are included, as well as clip-ons in case you already wear glasses. A viewer sitting to the side can see a good 3D picture and balanced colours from an angle of up to 45 degrees. But moving it backwards and forwards a bit, and finding your ideal seating position, will have to become part of your normal routine. With the 3D glasses, the effect varies widely depending on angle. TriDef 3D tells you how the screen should be positioned. 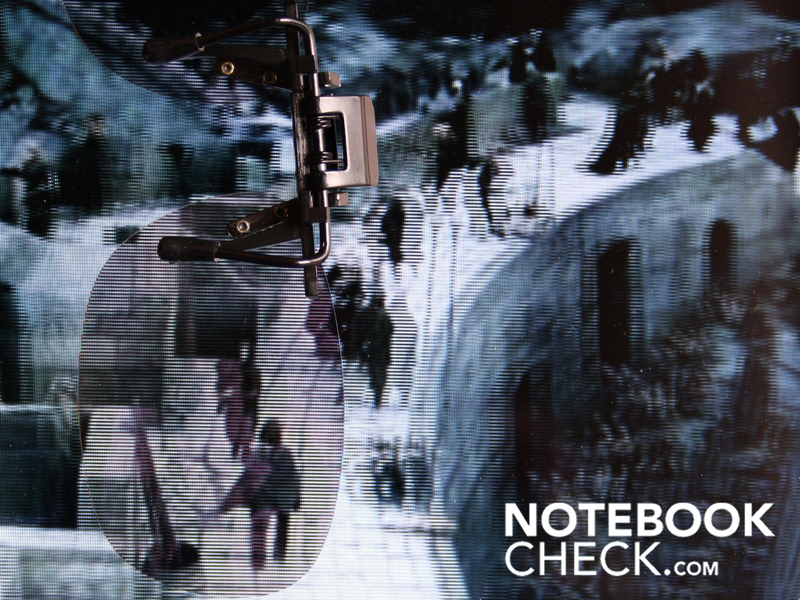 Three things differentiate this 3D notebook from a normal one: a special film over the TFT screen, special software which can calculate both halves of a 3D image in real time, and polarised glasses. 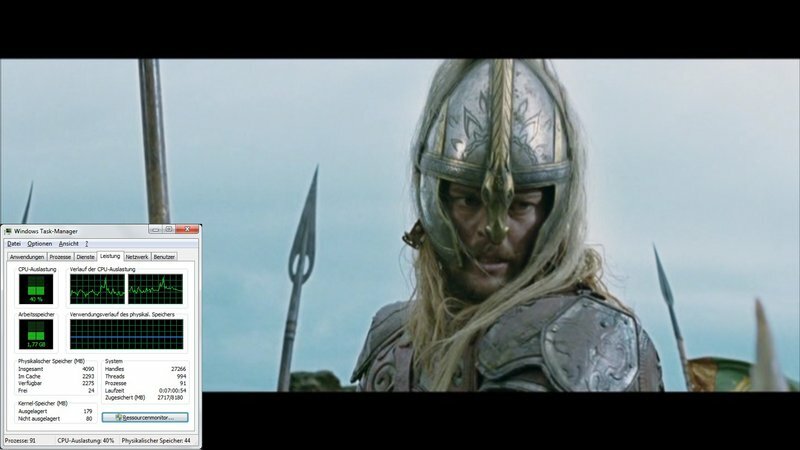 The software, called 'TriDef Ignition', converts the images of a film or 3D game into a stereoscopic image. For each image of the film, photo, etc, TriDef Ignition creates a stereoscopic counterpart (a process that exists in its purest form if you were to use a stereoscopic camera to film from two slightly offset perspectives). This is encoded into the image which appears on screen, a blurry mess if you are not wearing the glasses. The polarised glasses, which are no different to the polarising filters that are commonly used in photography, now provide a 3D experience. The blurred edges vanish and the eyes experience a 3D effect, stretching away from you into the screen. 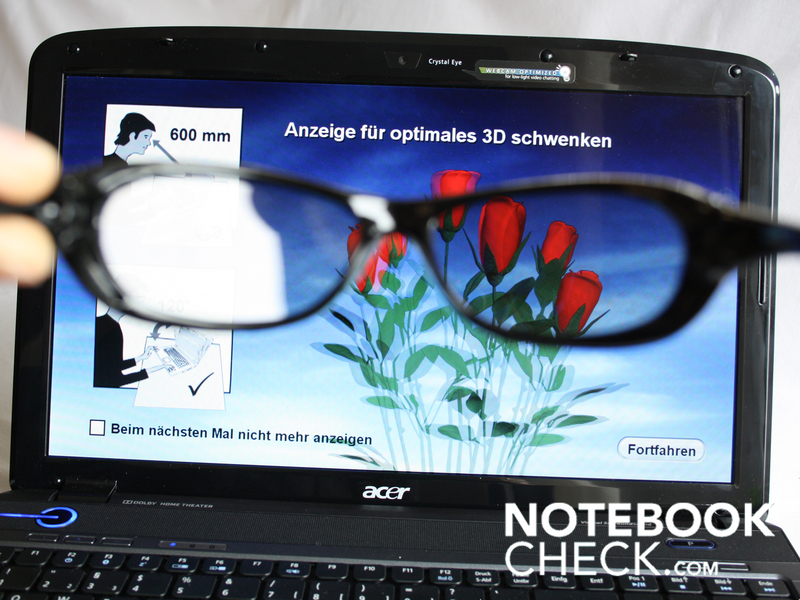 The stereoscopic 3D effect is not the Aspire 5738DG's default viewing option. If you want to use it for photos, films, and games, you have to open them deliberately with the TriDef Ignition software. 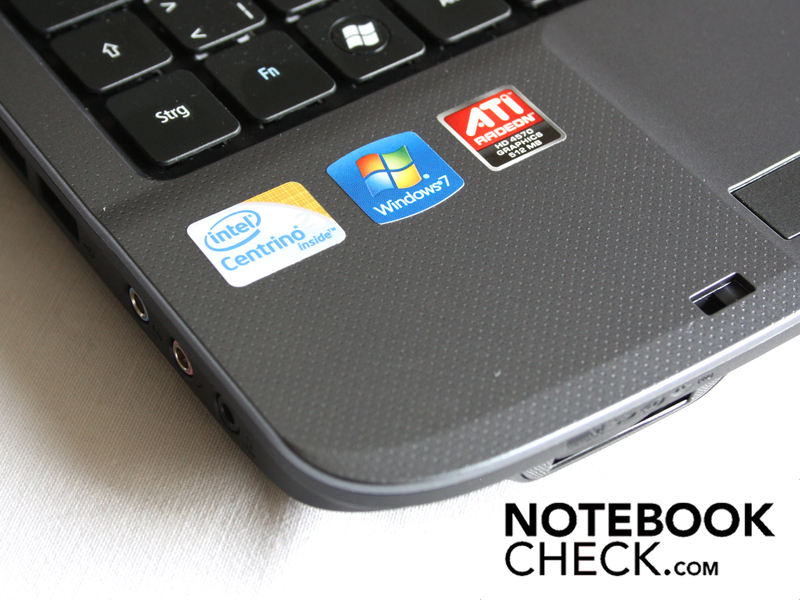 If you don't, the 5738DG could be just another perfectly ordinary 15.6-inch notebook. Despite its special filter, the display does not look any different to the naked eye. We tried out TriDef Ignition with photos, DVD films and games. 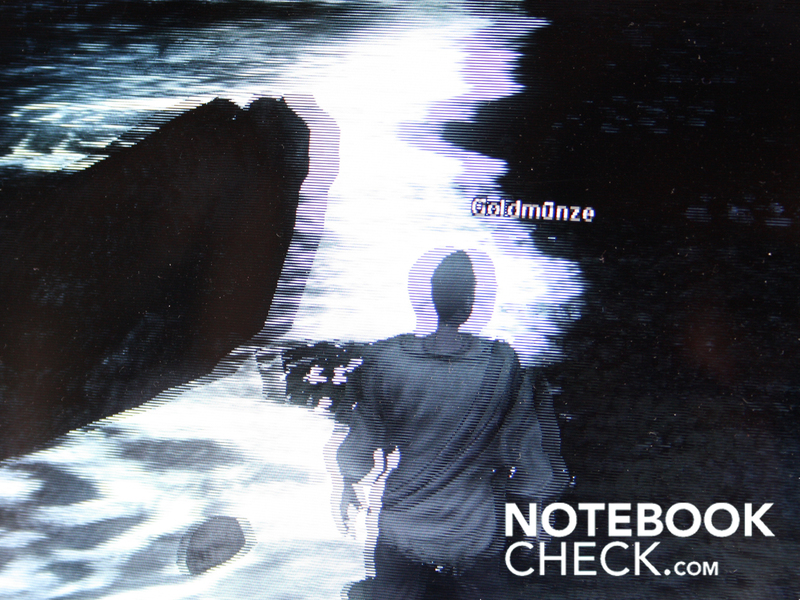 For our consideration of the notebook's gaming performance, please see our separate section on that subject. After 172 minutes of Lord of the Rings: The Two Towers, we can confirm that we are convinced! Although the 3D effect stretches away from you into the screen, it really does make the scenes more life-like. This is even true of the fast action sequences. TriDef has no performance problems here in calculating the stereo picture in real time. But one DVD is not exactly like another. The original quality of the encoded material was what determined whether we enjoyed a new dimension in film or whether we couldn't even see the difference. While we were delighted with Lord of the Rings in 3D, a film about magazine publishing was unconvincing. Holiday clips from a compact camera were wholly unsuitable. As the original material was indistinct and had a poor resolution, TriDef could not create an acceptable stereo image of it. Our personal photo collection, as it turned out, was not especially suitable for 3D use; an attractive 3D effect could not be created from the low resolution material. However we did establish that a clear distinction between foreground and background is helpful to the TriDef player. Therefore if you have a collection of high resolution photographs with clear contrasts in them, you might be able to experience them in 3D. Since it became apparent that the 3D effect swallows up about half of your GPU performance, gaming fans have turned away from 3D notebooks. 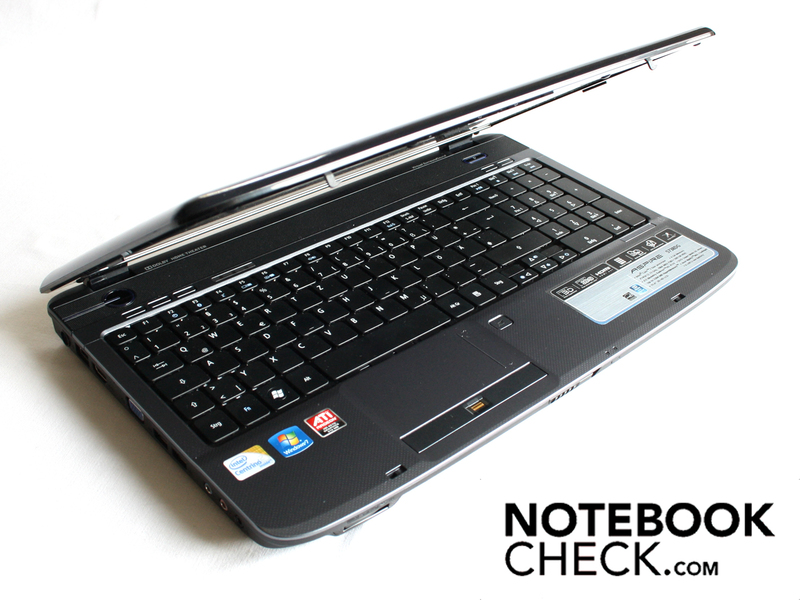 This notebook's integrated all-rounder graphics card, the ATI Radeon HD4570, is generally too weak for gaming anyway, and certainly has nothing to spare for 3D. This was the widespread opinion. But at this point we are not discussing performance, but the quality of the 3D picture (for performance considerations, see the section on gaming performance). The game Risen impressed us even more than the Lord of the Rings DVD. This may also have had something to do with the sense of involvement you have when playing a computer game. Despite the low frame rates, TriDef succeeded in producing clear stereo images. The following photos show the screen with and without the polarising filter. 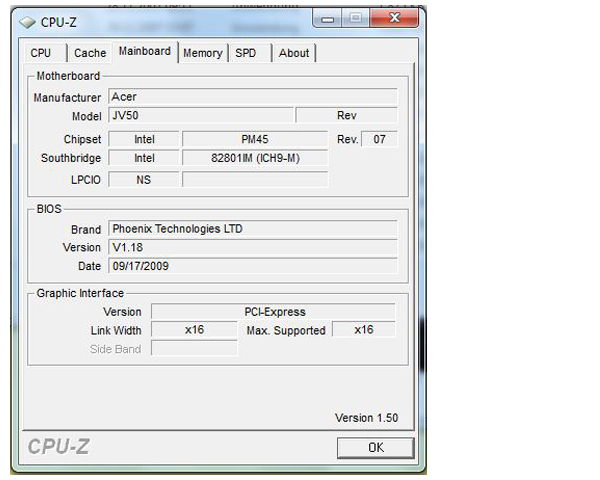 Acer has used a low-cost Intel Core 2 Duo P7450 processor with a 2.13 GHz clock. The 45 nm dual-core CPU relies on a 3MB L2 cache and a 1.066 MHz FSB. When push comes to shove, the P processor can draw 25 Watts from the power supply or battery. However, this is 10 Watts less than an Intel T series processor. Along with this is 4 GB of DDR2 RAM, which is pretty standard these days. 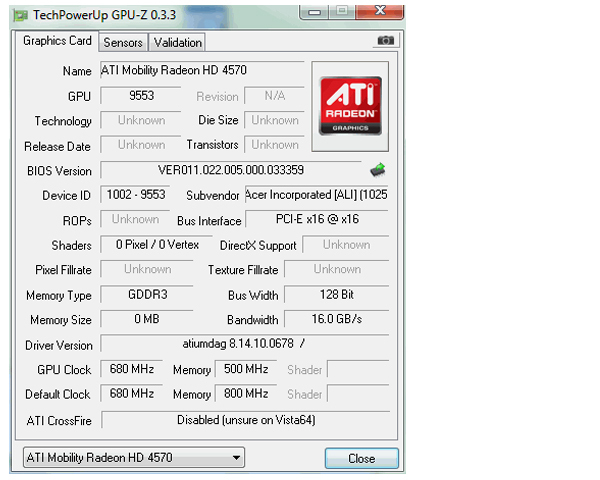 The ATI Mobility Radeon HD 4570 handles the graphical calculations with its own 512 MB of video memory. When necessary the GPU can borrow additional video memory from the main memory (up to a maximum of 1,792 MB). Our synthetic processor benchmark tests say that the Intel Core 2 Duo P7450 is fast enough to deal with office tasks. But if you are thinking of using any video editing software, you should think twice about getting the Acer Aspire 5738DG-744G50MN. 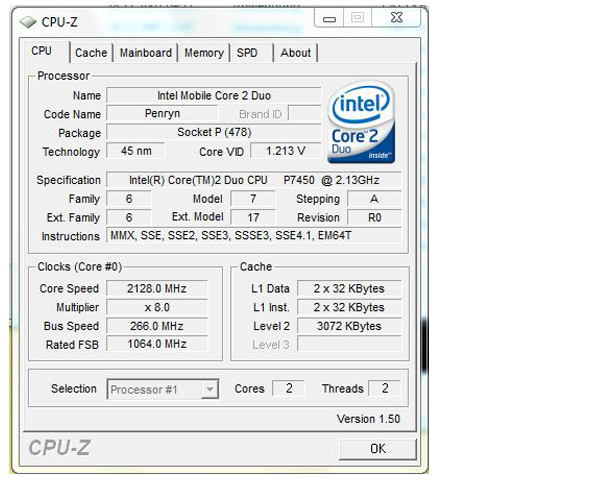 An Intel Core 2 Duo P8700 calculates markedly faster, and with a Core i7 720QM you would have exceptional performance. And yet it is not fair to criticise on this point. The Core 2 Duo P7450 is a good fit for a computer which is predominantly going to be used for consuming content. Those wanting to create content would ideally need a stronger processor as well as more ports and expansion slots. For graphical processing, Acer has gone for an Mobility Radeon HD4570, a DirectX 10.1 capable, low to mid-range GPU for notebooks. This graphics card with a 64-Bit memory bus is available with a range of memory capacities. 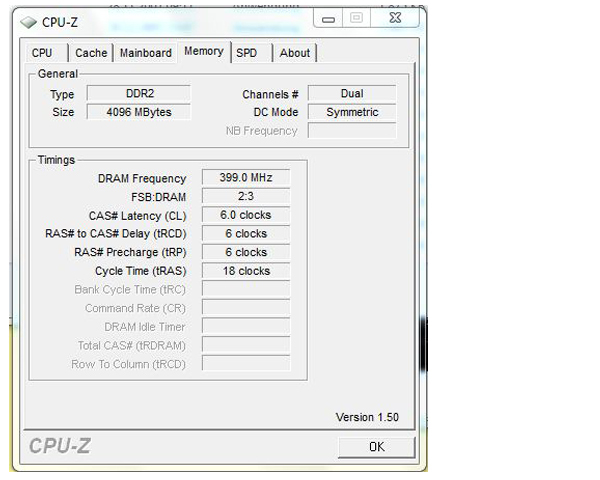 The HD4570 in our test model has DDR2 memory. In conjunction with the relatively slow processor, this does not allow for any particularly great feats in terms of graphics performance. We also took a look at the latencies under Windows. If these are too high, you may experience problems when using external devices (such as crackles of sound when using external sound cards or short interruptions in real-time audio). The values we took here were at times greater than 2000 µs. This is generally caused by faulty drivers for internal devices like the WLAN adaptor, soundcard, USB host controller or suchlike. 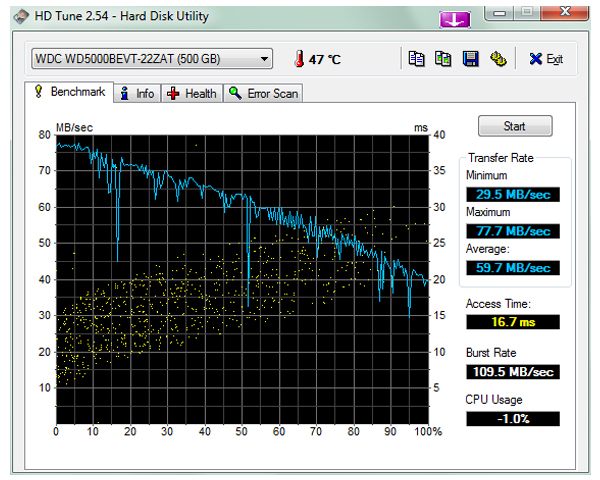 The Western Digital hard drive (model WD5000BEVT-22ZAT0), with a total capacity of 500 GB, produces the results you would expect; 59.7 MB/s is a typical average transfer rate for a modern SATA hard drive. 2,660 on 3DMark06 with an HD4570? We repeated the 3DMark06 test (1280 x 1024, external screen) many times but it stayed on this low score. 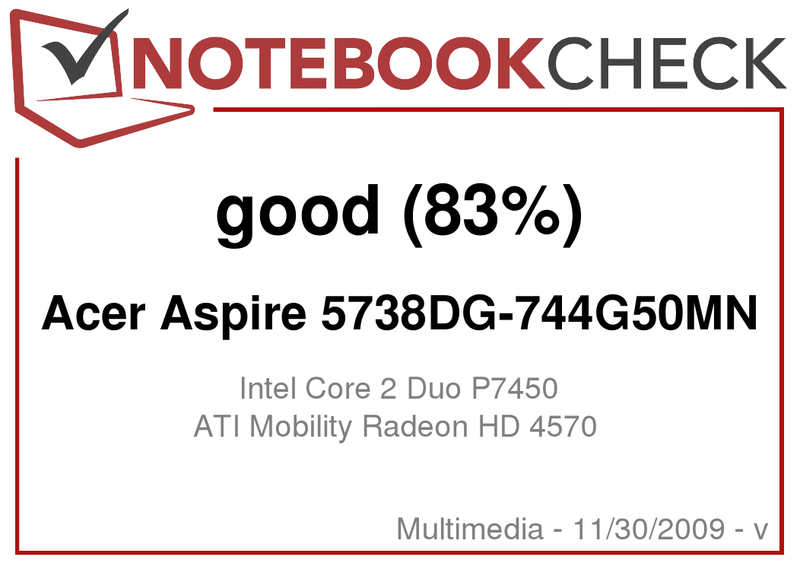 The result corresponds pretty closely with that of the Aspire 5536G from May of 2009. The 15.9-inch 5536G also had the exact same case as this 'brand new' 3D notebook. Although the 5738DG no longer relies on an AMD M780G chipset, but rather on an Intel Cantiga PM45, both models have this particularly poor graphical performance in common. The HD 4570 can achieve a 3DMark06 score of up to 4,000 when it is combined with a strong processor. 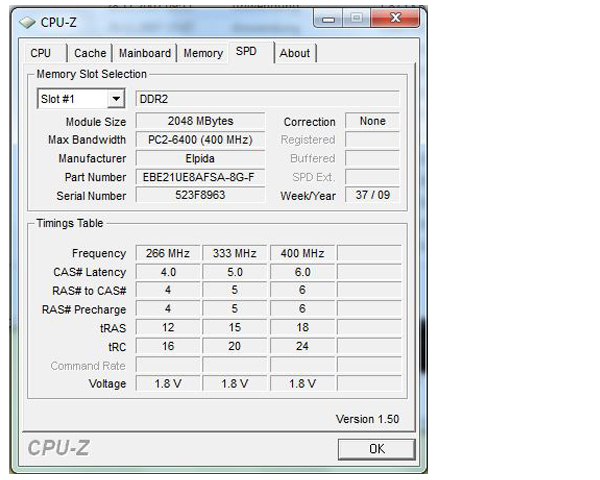 GPU-Z lists 680 and 800 MHz as the speed for the core and video memory respectively. The latter is GDDR3, according to GPU-Z. What GPU-Z can't tell you: there is only 512 MB of dedicated video memory available. The following tests show that with the low to mid-range ATI Radeon HD4570 graphics card several modern games are playable, at least on their lowest resolution and detail settings. But as for its performance with the additional burden of the TriDef 3D software, the worst fears of gamers are realised: when TriDef 3D uses the GPU, graphical performance drops by about 50%. If it was struggling with a game beforehand, it will now be all but crippled. 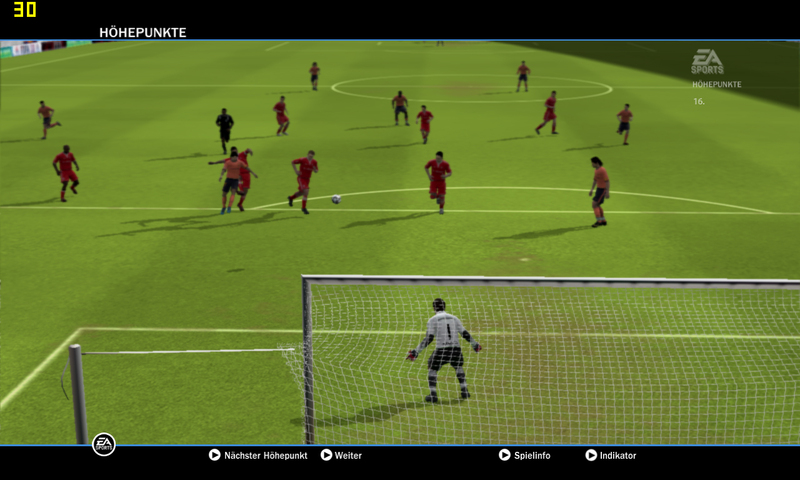 Electronic Arts' new football management game FIFA 10 (Demo) runs without problems in its native resolution (1366 x 768) and on its highest detail setting. 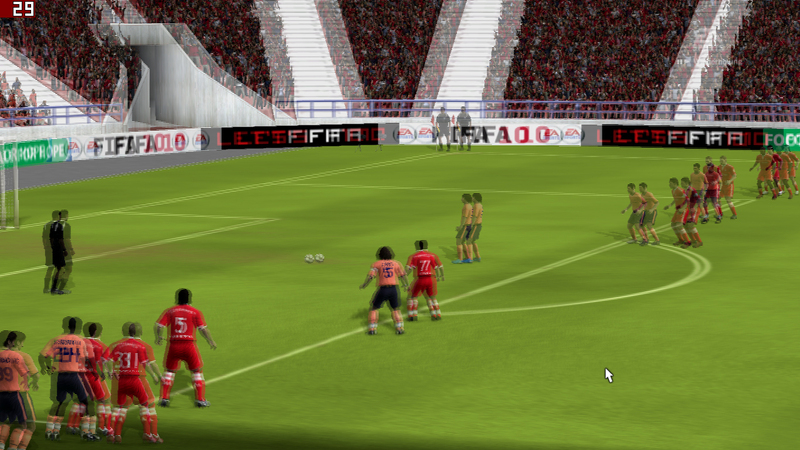 58.32 fps, what more could a football fan ask for? Even when we don the 3D glasses and TriDef uses the GPU to create a stereo image in real-time, the frame rate remains fairly acceptable at 28.8 fps. The sequences of game highlights in 3D in particular leave you wanting more. As feared, Risen barely runs at all. Even without 3D mode, the gameplay stutters along at less than 11 frames per second (at 1366 x 768). The HD4570 takes all the fun out of this latest role playing game by Piranha Bytes. Only on the lowest resolution (800 x 600) and the lowest detail setting (low, 0xAA) does the game run fluidly. But then you can hardly bear to look at it. And while the 3D effect does look very good on the highest detail setting, the game is then completely unplayable at 5.63 fps. Even with the resolution at an undesirable 800 x 600 pixels and the details on their lowest setting, Fraps measures no more than 15.5 fps. The Aspire 5738DG's fan runs continuously. Our sound meter never fell below 34.2 dB(A). 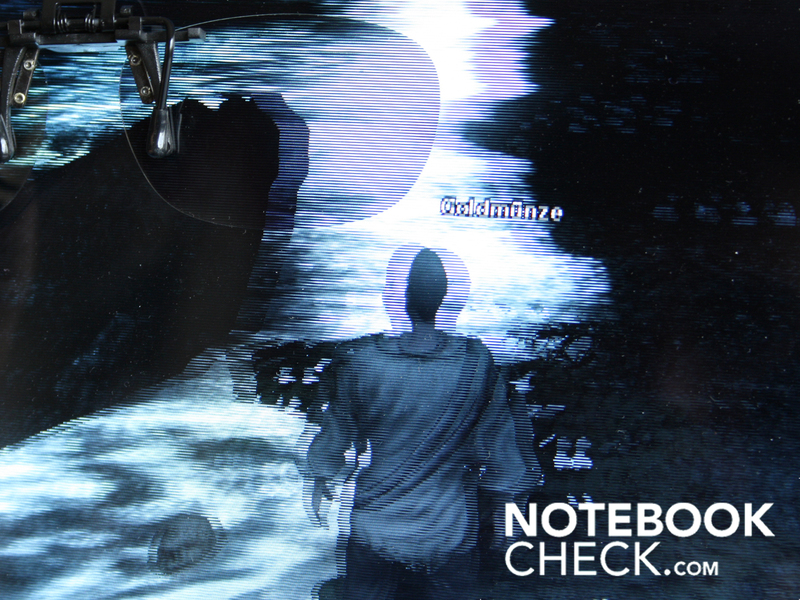 As soon as the notebook has some work to do, whether it is the graphics card or the processor, the fan quickens noticeably. We measured an average of 41.4 dB(A). The sound of the fan is an even whir in the mid-frequency range. The increase in temperature on the upper side of the laptop can be described as inoffensive. Even after a stress test on the processor and graphics card we reached no more than 35 degrees Celsius on the palm rest area. In the area of the power socket it did reach 37 degrees. However on the laptop's underside we measured considerably higher temperatures. Under heavy use we measured 46 degrees in the region of the fan and heatpipe. At this point if not before it would be uncomfortable to work with the laptop on your lap. But during a more realistic scenario where the notebook alternates between busy and idle periods, the Aspire 5738DG stays manageably cool. So for example the left palm rest area in idle mode reaches only 28.7 degrees. 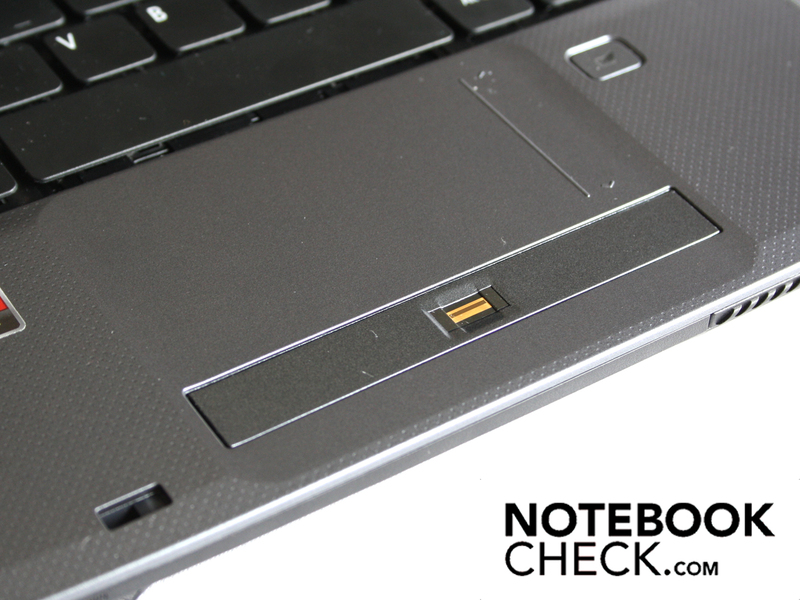 The Aspire 5738DG also survived a stress test of 15 hours' use without complaints. The processor never exceeded the core temperature of 76 degrees C. The stress test also failed to have an impact on the performance of the components. A 3DMark06 test carried out directly afterwards achieved the same (low) score as the test carried out under normal conditions: 2,663. 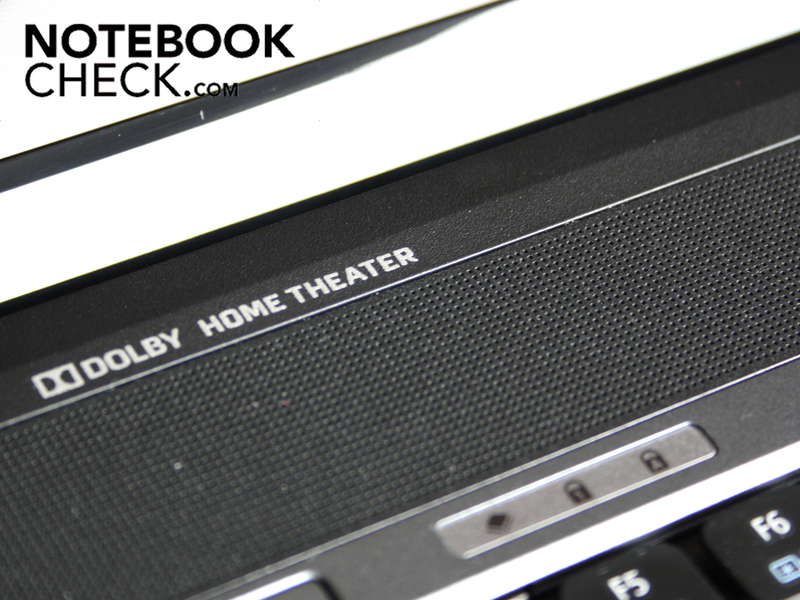 Acer has written 'Dolby Home Theater' on the casing, but the notebook's stereo speakers are insufficient for multimedia use. When music is turned up loud, the sound quality is tinny and jangly. Whatever settings we used in the Audio Enhancer, we couldn't get the Surround Sound to come on and the sound quality would not improve. It remained too highly concentrated on the mid-range frequencies. As there is no subwoofer, the deep bass sounds are absent. Those wanting to connect up an external sound card will appreciate the noise-free and high-performance output. Even with a very low output volume, no background hum emerges. It is also good to see the audio line-in which is quite uncommon. The Aspire 5738DG's battery life during a typical internet session with WLAN is about 2 hours 25 minutes (145 minutes). During this time we downloaded several YouTube clips and visited many web portals decorated with Flash animations. If you are frugal and only work in a word processing program with all energy saving measures enabled, you can achieve battery run times of up to four hours. The maximum, though unrealistic, battery life which we achieved using the BatteryEater Readers Test was 256 minutes. The CPU was limited to a maximum performance of 40%. We were particularly interested to see how long it would last when watching a DVD in 3D mode. The playback time without using TriDef stood at 140 minutes. We let the same title (Lord of the Rings: The Two Towers) run in 3D mode and it lasted 117 minutes. In the energy saving options we set the maximum performance of the processor to 10% in both cases. Despite this the film ran smoothly both times, as long as no other applications were in use. The load on the processor was less while using the TriDef 3D player, but in both cases it was at a very low level. This is because even Windows Media Player has used the GPU to decode a DVD for years now. 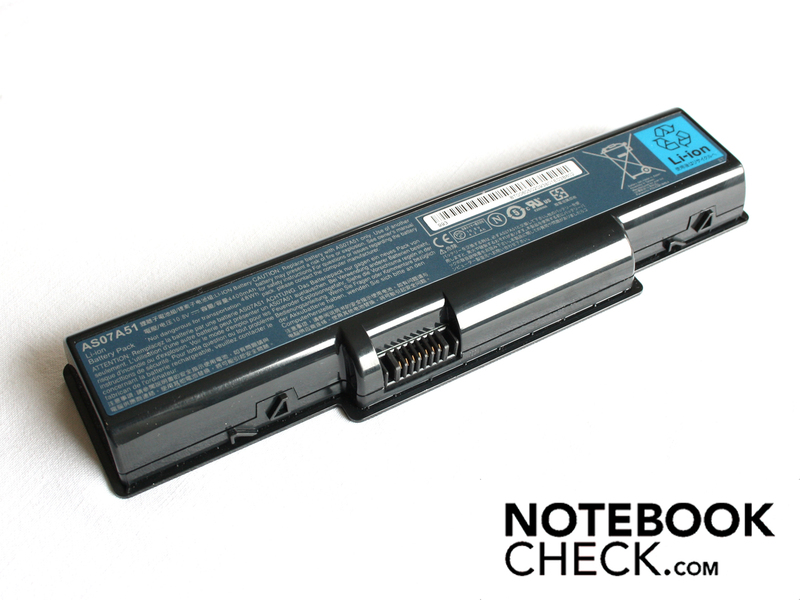 These battery run times in the various operating modes, respectable for a 15.6-inch notebook, are matched by its low energy consumption. 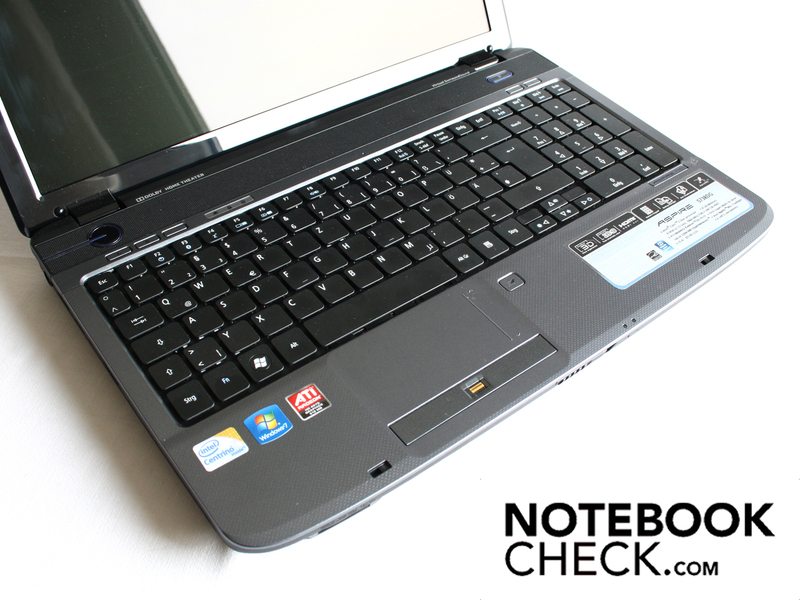 The Aspire 5738DG's minimum power consumption was 14.1 Watts. But it was 21.5 Watts during the realistic idle scenario with WLAN activated and the highest brightness setting. When the Intel Core 2 Duo P7450 and the ATI Mobility Radeon HD4570 were operating at full capacity, the average power drain was 63.5 Watts. Such a high energy usage, however, should not even be reached whilst gaming. During the games of the 3DMark06 test, for example, the energy consumption was around 49.5 Watts. The mains adaptor is too small when you take into account this maximum possible energy usage. The LiteOn mains adaptor is designed for 65 Watts. If you were to add to the 63.5 Watts mentioned above even a low consumption of 5 Watts to recharge the battery, you would have exceeded the 65 Watt capacity of the mains adaptor. 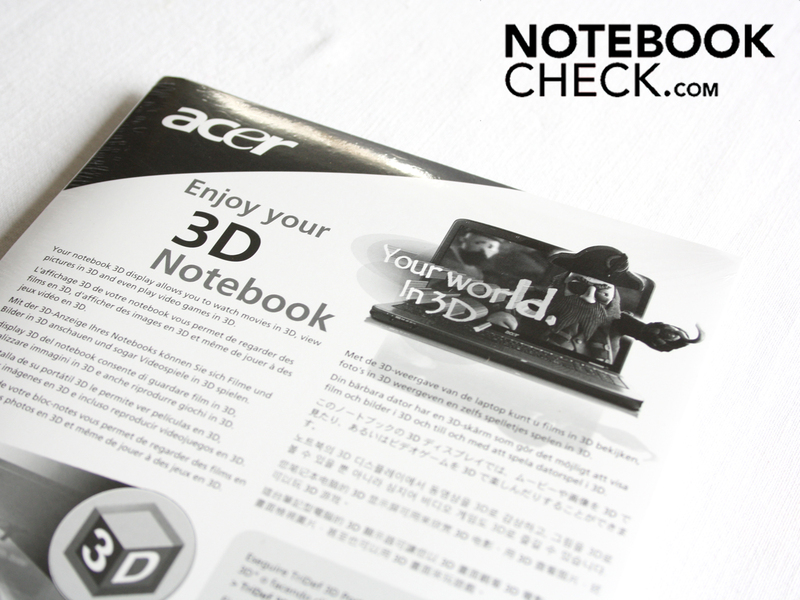 Acer's approach to the 3D notebook made a good impression on us. 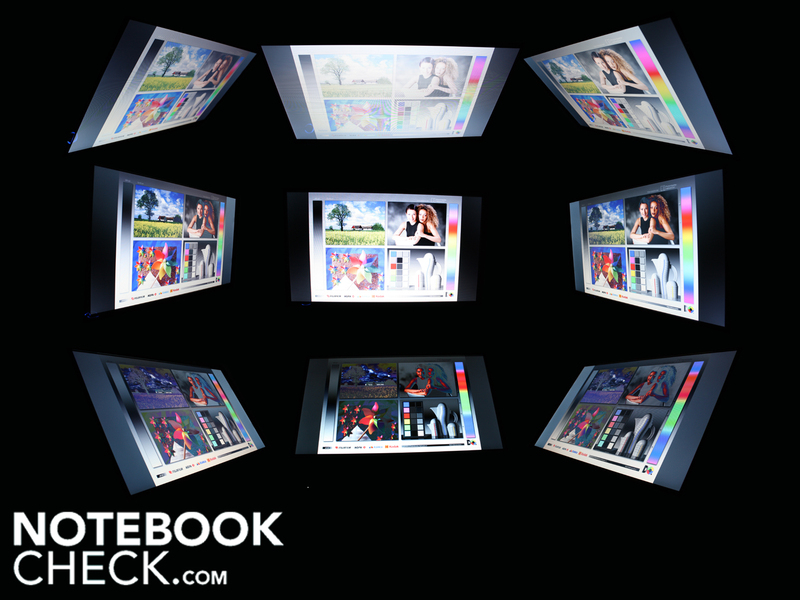 It was able to render DVDs and photographs with an attractive new perception of depth. The better the quality of the starting material, the easier it was for the TriDef software to create a stereoscopic image from it. In games particularly, the 3D effect is excellent and could find some followers despite being strongly dependent on viewing angle. 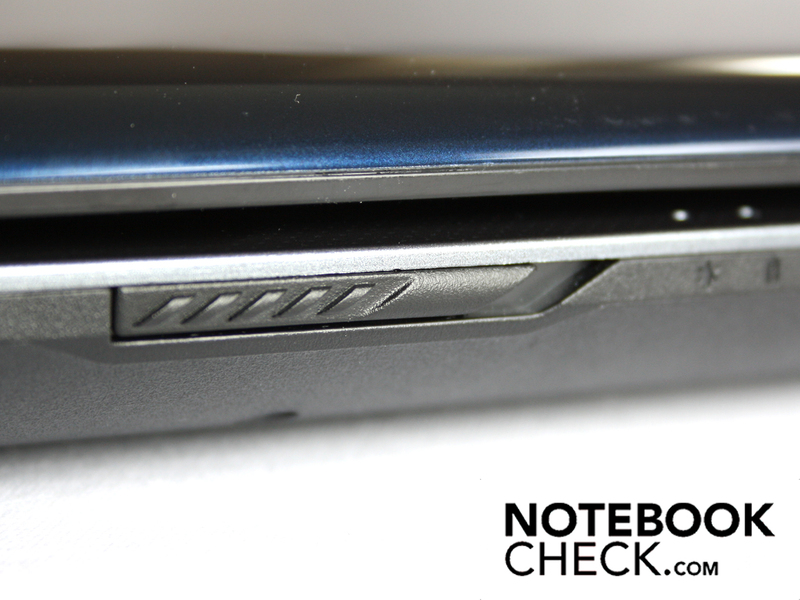 Unfortunately the ATI Mobility HD 4570 (512 MB DDR3) lets the side down, especially in a 3D notebook. Even without the 3D effect, the gaming performance is very modest. And with TriDef 3D, the frame rates plummet, even with lower resolutions. Only the odd game like FIFA 10, which makes very few demands on the hardware, can be played fluently using the 3D polarised glasses. 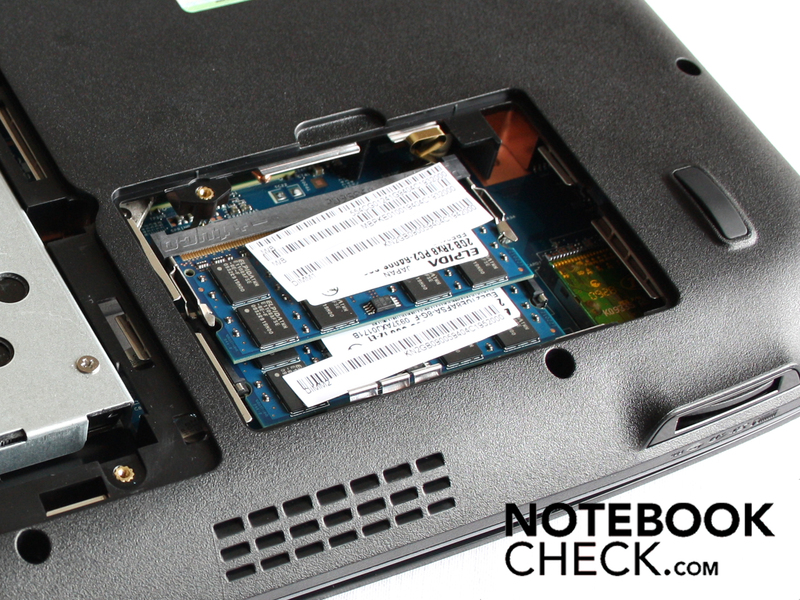 When thought of as a multimedia notebook, the 5738DG-744G50MN leaves a lot to be desired. The case and keyboard are high quality and well suited for use as an office machine. Genuine multimedia features such as a subwoofer, separate multimedia controls, a blu-ray drive or remote control are missing entirely, and the screen has a poor contrast ratio. 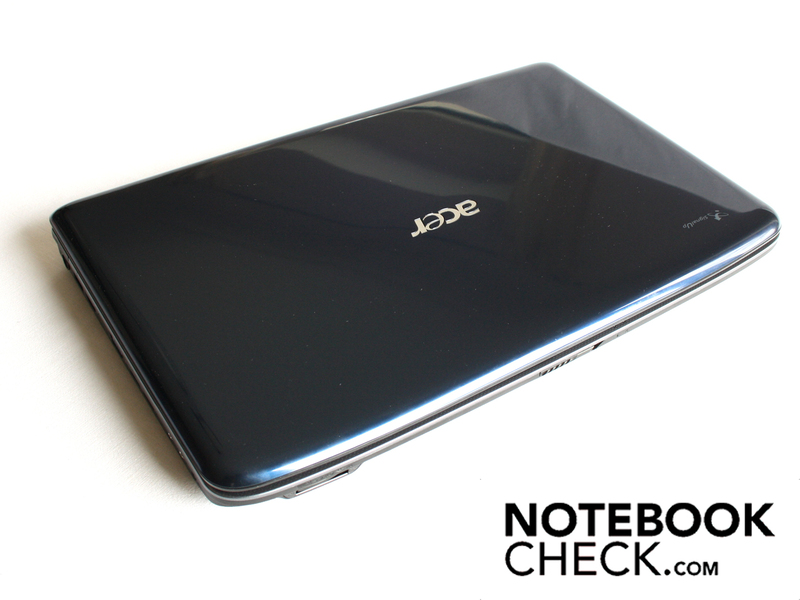 We got the impression that Acer had simply picked, at random, an all-rounder set-up as a platform for its 3D ambitions. Apart from an HDMI port and three audio ports, the 5738DG does not possess any particular multimedia features other than the TriDef 3D capability. Just another 15.6-inch notebook from Acer. Or is it? The lid lock is slippy and never opens first time. 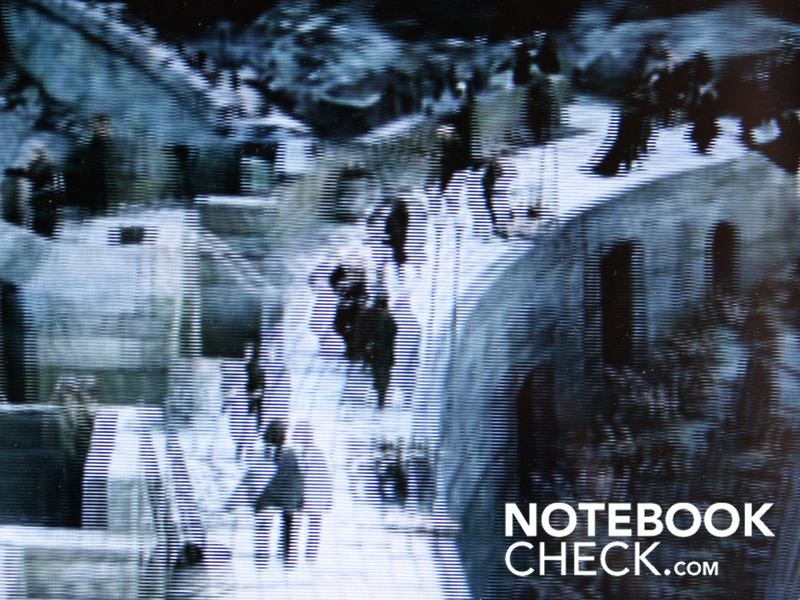 As you would expect, the notebook has an integrated webcam. But the stereo sound system with two loudspeakers does not live up to its name. The strongly glowing power button can quickly get irritating during a film session. On the other hand the keys are well-made, perfect for those who type a lot. The Aspire 5738DG doesn't work well in sunlight. If you are not working under a cloudy sky, you will be distracted by reflections. The battery provides run times of 87 minutes (min) up to 265 (max). The 65 Watt mains adaptor is too weak for the notebook when it is running flat out. The DDR2 memory comes in two modules. and does not try to hide its size through sleek curves. 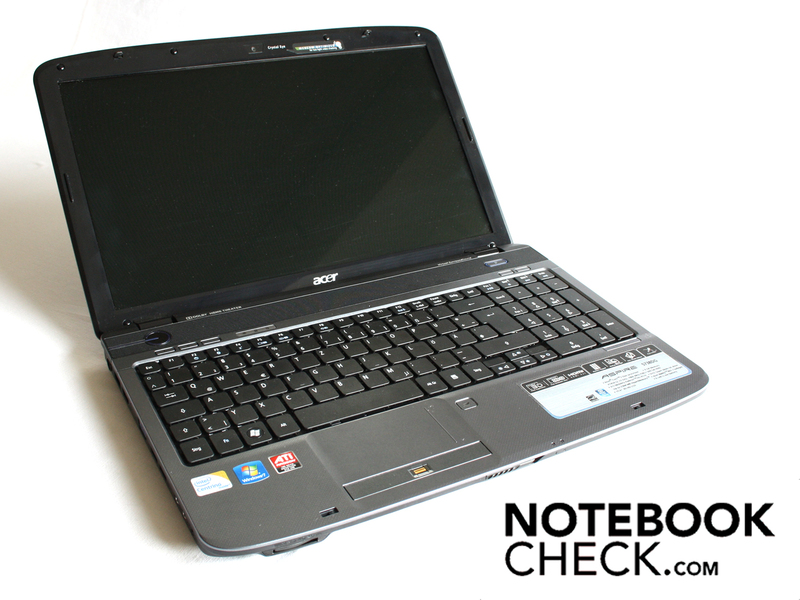 The Acer Aspire 5738DG - known as the 3D notebook. An inconspicuous sticker refers to a 'CineReal 3D View Experience'. A pair of glasses and some clip-ons come tumbling out of the box. Two pages of instructions explain what to do with the glasses. The glasses are polarising filters, like those used in photography. Our films look suddenly different with the TriDef 3D player. 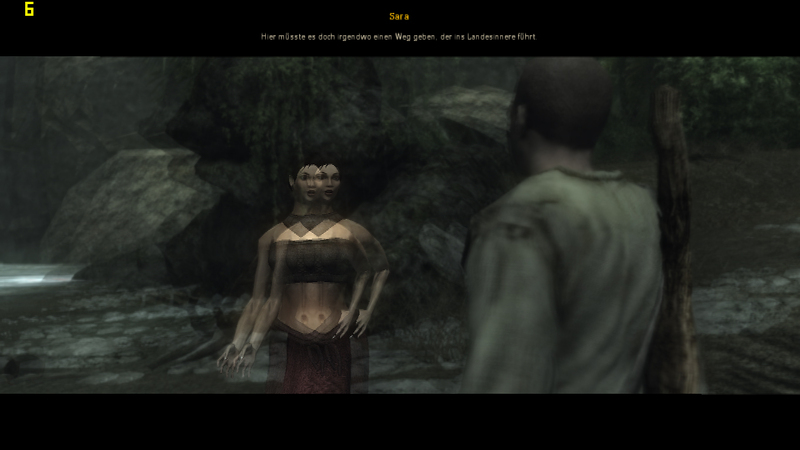 The TriDef software generates a stereoscopic image using the graphics card. You can tell by the small shadows. It also works quite well at times with personal photos. But the illusion of depth only emerges when you put the 3D glasses on. The hard drive and WLAN module can also be replaced. A 3D effect that is as good as promised - as long as you're not a gamer. Considerably more graphics performance and a 17-inch screen would have made it the ideal 3D notebook. That a 3D effect can be produced on a standard TFT screen with such simple props. Could there soon be a 3D notebook kit for 49.95 euros, made up of glasses, a screen filter and theTriDef software? A 3D notebook for 800 euros is a first. Serious gamers should watch for the Asus G51J 3D in the next few months. This uses LCD shutter glasses and Nvidia Vision for a 3D experience.